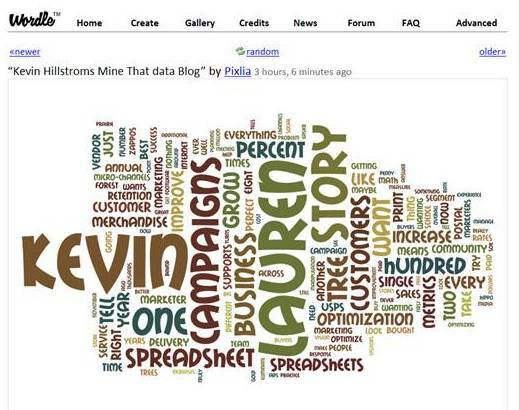 One of our loyal readers, named "Anonymous", forwarded this word cloud of the MineThatData Blog. Word clouds, of course, convey the phrases that are prominent on the blog, coupled with words that are used in association with each other. Notice that Lauren Fetzer gets a disproportionate amount of space! 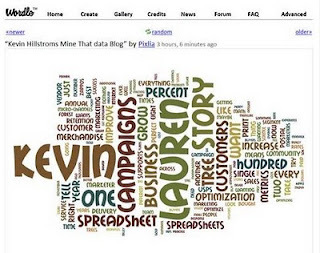 To create your own Word Cloud for any website you commonly read, visit Wordle. Word clouds are very handy tools. I recently used them to visually display the difference between the characteristics of some segments I had created of Twitter followers using text mining and clustering techniques. It helps get the point across right away.